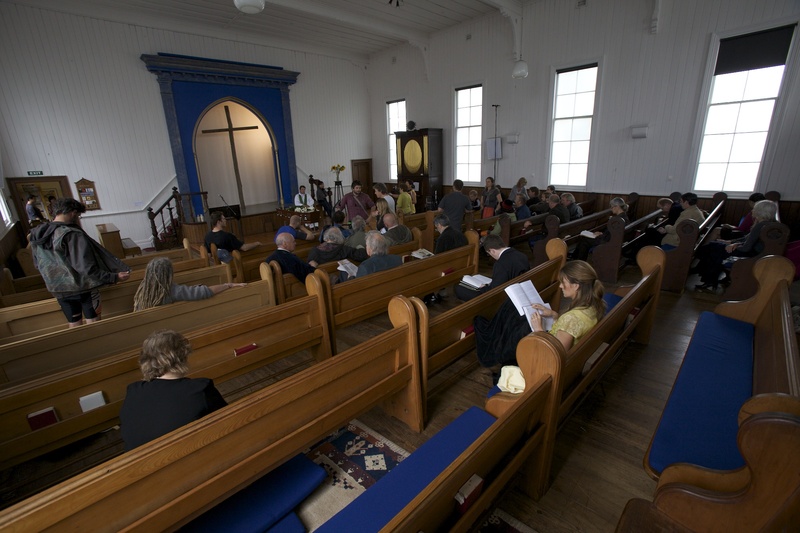 There is a near-deathly still in our improvised green room this morning – I’m surrounded by about 60 people filling the pews of the church whose hall serves as the set for the raucous public meeting scene. These 60 are the good folks who have come to be extras; every few minutes a crackling walkie-talkie erupts into life, then Steve, our 2nd AD tells us to be quiet, please, and the heads of the 60 extras gently lurch forward, burrowing into the many books and magazines brought for safety. As I scour the room I see several New Zealand Heralds, one ‘No One Went to Town’ by Phyllis Johnston, a Guardian Weekly, and one ‘Portable Atheist’, edited by Christopher Hitchens. It’s encouraging to see that someone has even brought a copy of a certain 1997 Ponsonby-set novel by Mr Michael Riddell. The fact that we’re in a church lends an ecclesiastical irony to these things – ‘The Insatiable Moon’ takes place in a world where institutional religion has failed to provide life to the people; and where spirituality exists at the place where trouble and grace collide – I suppose another way of putting this would be ‘real life’. ‘The Insatiable Moon’ is about real life – about how being bound together by a the same destiny (what Bertrand Russell somewhat pessimistically called ‘a common doom’) means that, not to put too fine a point on it, life is hard. The trick, as both Lawrence of Arabia and M Scott Peck might say, is not minding. Arthur, our protagonist (and if a protagonist is a character who acts to shape the world around them, then Arthur is definitely a protagonist), wants to help the whole world get through the labyrinth of choices (our own and other people’s) that every day brings. Arthur wants to help people see themselves for the extraordinary mystery they are – what the poet and former Czech President Vaclav Havel called ‘the story of the fresh creation of the world that every new human existence is’. It’s a tall order to see yourself as a miracle in a world colonised by traffic jams and gossip about Tiger Woods. But today, 60 people are sitting in a church, waiting around, sitting quietly, anticipating the moment when someone will call ‘Action!’, and they will participate in telling a story that, we hope, will leave people a little surer of the notion that maybe their life is a miracle after all. i’m so enjoying following the birthing process of all this. it’s great to see your collective determination after all these years being rewarded. glad to see it’s been going so well for you all – it’s looking like an enriching creative environment to be a part of. not that i’d expect anything less from you folks. much love and good wishes to you and Rose. and indeed to the good dr higgins. Congratulations – Today Tuesday 8-12-09 was great on set. It is so refreshing being surrounded by ‘extras’ and ‘budding actors’ freely giving their time and effort to what is obviously a great production. Too bad for those who foolishly said ‘I don’t work for nothing!’ Cheers. Thanks Colin for being an integral part of it all and contributing to a great scene. THank you so much for the opportunity of being an extra yesterday. I loved the whole day and had some great interactions with various folk I’d never met before. The whole day was such a deeply spiritual experience that I have pondered on it all day and will continue to do so for sometime I am sure. Questions arise like ‘ Am I judgemental like some of the characters in yesterday’s story?’ I hope not. IT was also intriguing that at the end of the day when some extras were asked to spontaneously make a speech from the podium at the ‘meeting’ none were against the closure of the boarding house and no-one wanted to take that position even to make the story. IT’s heartening that there are such good people around!! If there is anything else I can contribute in any way please let me know. In any event it has been a privilege to be part of ‘The Insatiable Moon’ THanks again. it will be a beautiful thing Mike…..